I have a cousin slightly older than me who's got three husbands, yet for some strange reason she only visits them one at a time. But having said that, though, she is a massive prostitute, and she just loves to watch the following 77 minute movie made in 1950. It was Directed by: Irving Reis; and Starred: Eve Arden, Ruth Warrick, with Vanessa Brown. Excuse me, Saint Michael. But I was wondering if you'd allow me to eavesdrop on a couple of friends of mine. You see, prior to passing away, I diligently left behind three letters that re-defined the sanctity of their marriages. Now in the first letter I implied to my pal Arthur (Shepperd Strudwick) that I was doing to his wife Jane (Ruth Warrick) what he wanted to do to that artist, Matilda Clegg (Louise Erickson). If you catch my drift! In the next letter I sent to my Mummy's boy of a nephew, Kenneth (Robert Karnes), I insinuated that his wife Mary (Vanessa Brown) took care of me a little too well whilst she was nursing me back to health. Wink-wink! And finally, in a letter I sent to my old mate Dan (Howard Da Silva), I inferred that I taught his wife Lucille (Eve Arden) the French language in a rather oral fashion. Au Jed wee, mon ami? So what do you say, Saint Mick? Will you allow me to eavesdrop on my friend's? Or is that why what next transpires gets rather emotional when you say to me, 'Sure, Max (Emlyn Williams). You can eavesdrop on you friends. You crafty beggar you'. As one of the couples have a blazing row - another couple rethink about a solemn vow - the third paring decide to call it quits - and at the end of the day, the reading of a will makes everyone do the splits. 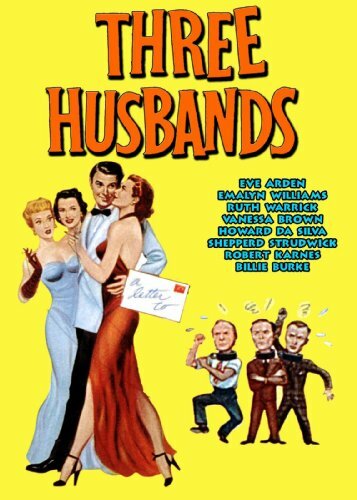 On the whole I'd say 'Three Husbands' is one of those films' which has it all. It has a great cast of characters which were as charming as charming can be. It has a pretext which is one part jovial, one part suspenseful, and all parts captivating. And to top it all off, I just loved watching every single minute of it, as it was one of the most delightful films I've had the pleasure of reviewing for quite some time. You see, essentially it tells a tale of three men who try to deal with a message sent to them by a dearly departed friend -- played magnificently by Emlyn Williams -- insinuating that he 'went' with their wives while their backs were turned. Of course, with this being a film developed during the early fifties, there isn't any actual naughtiness going on in front of the camera. Instead, all of the naughtiness is implied to have happened behind the camera, if at all. Now from a structural point of view its initial premise was set up very quickly, before allowing the rest of the movie to tackle the three individual scenarios one at a time. And in so doing it also allows the characters to grow, the plots to become more absorbing, as well as to allow us -- the audience -- to try to figure out if Max's initial three letters are true or not. Thankfully, this simple structure is enhanced to an even greater degree by some sparkling performances. Even though I personally preferred watching the segment played by Howard Da Silva and Eve Arden -- because they were so funny in it -- that's not to take anything away from those other two segments. Cause each of them -- in their own subtle manner -- allowed the plot and the pretext to be painted in different emotional hues. One of them with a more sombre tone. One of them with a more sweeter tone. And one of them, as I implied previously, was very down to Earth funny. I mean, take one of my most favorite scenes for instance. In it, Eve is being harassed by two racing pundits, who try to get her to back a certain horse. When suddenly her husband shows up -- as played by Howard -- who tries to break up this jovial encounter by nudging these two pundits to one side. 'Hey! Do you know who this woman is?' says one of the pundits to Howard. 'Yeah! Slightly!' he says in turn. 'She's my wife'. Ha! What a hoot! Oh! And while I'm on the subject of the men in this film, let's not forget how each of them took a different approach at dealing with Max's letters. Once again, making three similar sounding story-points possess a differentiating perspective from one another. Never the same. Never too different. Yet always cohesive and whole. Anyway. I'm sure by now you got the basic gist of what I thought about this marvelous comedy. So how about we all now sit back, relax, and check out the following filmic-facts. (1) 'United Artists' first released this production in San Francisco, California, on the exact same day William Faulkner was awarded the Nobel prise for literature. It was on the 10th of November, 1950. (2) Loosely translated, this project was entitled 'Three Wives for a Lover' in Sweden; 'Don Juan's Suicide Notes' in Denmark; and 'Three Husbands Cheated' in Portugal. (3) The majority of this movie was shot at Hollywood's 'Motion Picture Movie Studios', situated within the Californian state of Los Angeles. (4) Vera Caspary, who's a well known novelist that wrote this film, is best known for writing and adapting the screenplay for the 1968 John Llewellyn Moxey classic, 'Laura'. (5) This comedy was directed by Irving Reis, and his claim to fame was to set up and manage the 'CBS Radio Columbia Workshop' during the 1930's. (6) If you look very closely at that scene where Arthur is playing poker, you'll notice in one shot he's holding his cards in his left hand, whilst in the next shot he's holding them in his right. Ops! Slight continuity gaff. (7) Herschel Burke Gilbert composed the song 'Poor Chap' for this movie, and throughout his sixty year career devised the arrangements for such productions as 'It's A Wonderful Life', 'The Adventures Of Superman', 'Leave It to Beaver', 'Gilligan's Island', and 'Perry Mason'. (8) After this flick committed bigamy, Eve Arden starred in the TV series, 'Starlight Theatre'; Ruth Warrick starred in the musical, 'Let's Dance'; and Vanessa Brown starred in an episode of the 'Pulitzer Prize Playhouse'. 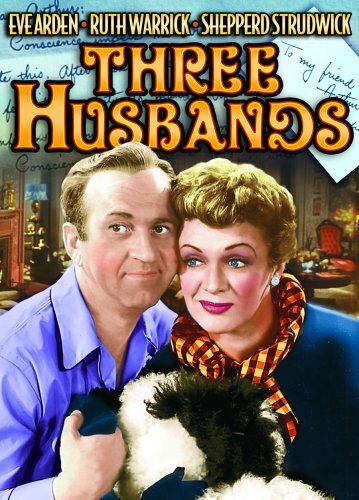 Overall I'd say 'Three Husbands' was one hell of a cracking film for all the family. Not only does it start off in a very original manner -- visions of heaven, anyone? -- but it also ends on a very funny note too. Mwwwa!